We really couldn’t have hoped for a better day of football. The Hamilton sun was shining, there was a cool autumn breeze and the Tiger-Cat’s had come ready to play! Our day started off at Kindertown, where families and a bunch of new fans piled onto the school bus heading towards Tim Horton’s Field. As we got closer to the field, the anticipation for the days event continued to grow. After shuffling our way through the gates, we made our way to the sidelines, staring in awe as the local boys got warmed-up for their big rematch with the B.C Lions. However, before kick-off, Kindertown Fans had the opportunity to take part in the National Anthem Ceremony and HUGE Canadian flag unveiling. For some, the experience was unforgettable, for others, the loud fireworks could’ve been a wee-bit quieter. After preparing ourselves with popcorn, hotdogs and coffee, we made our way to the seats and watched with excitement as our Hamilton Tiger-Cats steamrolled their way through the B.C Lions 40-10!!! After all this action, our newest Ti-Cat fans were happy, excited and exhausted. 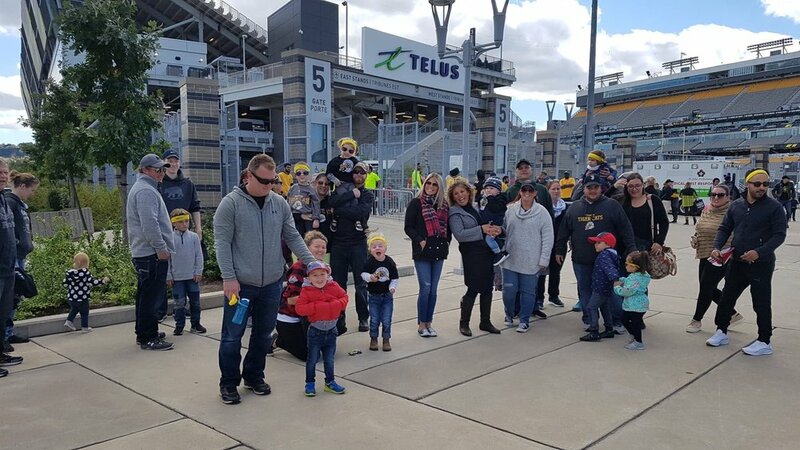 We couldn’t have asked for a better day of football, for our families and the Hamilton Tiger-Cats. OSKEE-WEE-WEE!!!! !